"Right now I feel I can take on the whole Empire myself." In the war against the Galactic Empire, the Rebel Alliance needs all the help they can get. Though they fight for the freedom of the galaxy, they are outmatched by the pure military forces of the Empire. Luckily, reinforcements have arrived to supplement your troops. 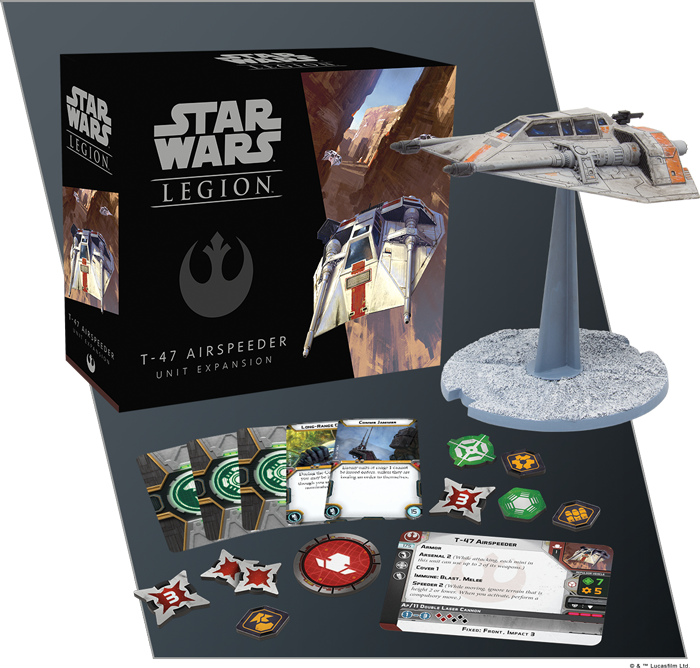 Today, Star Wars™: Legion has gone on sale, and you're already able to supplement your forces with a wide array of expansions. 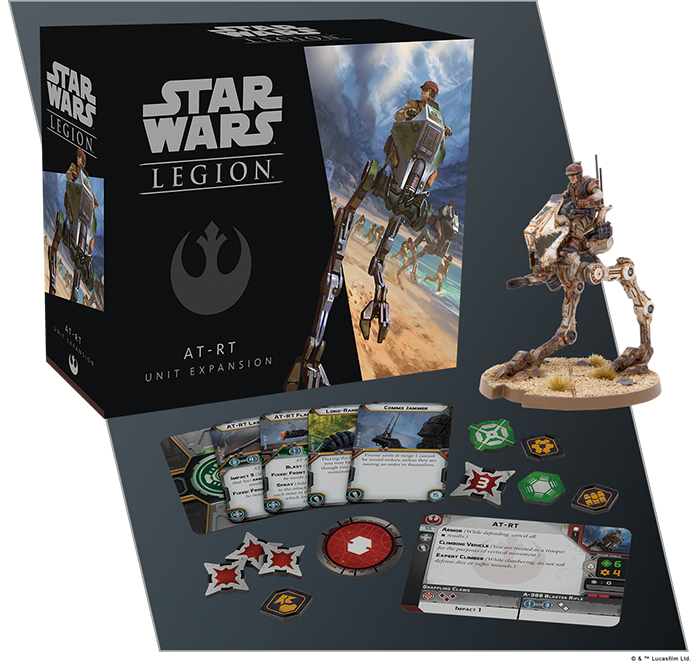 For the forces of the Rebel Alliance alone, the Rebel Troopers Unit Expansion, the AT-RT Unit Expansion, and the T-47 Airspeeder Unit Expansion for Star Wars: Legion are available now from your local retailer or our website! 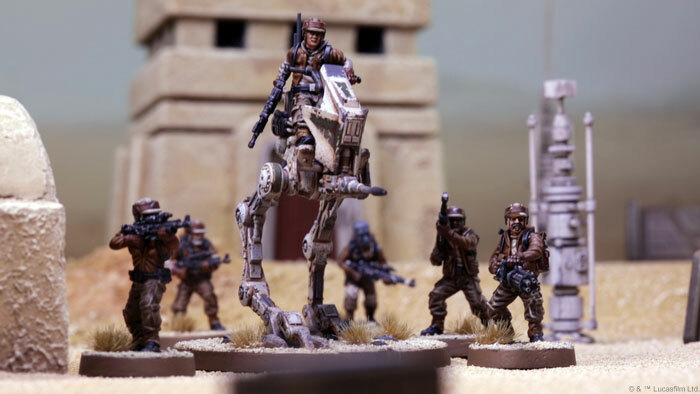 Enhance your Star Wars: Legion army with the Rebel Troopers Unit Expansion, featuring seven unpainted, easily assembled Rebel Trooper miniatures! Rebellions are waged by the boots on the ground. Soldiers from all walks of life gather with the common goal of overthrowing an Empire, and while heroes like Luke Skywalker lead the charge, it will be the Rebel Troopers that make up the backbone of your army. At 40 points for a standard squad of four Rebel Troopers, they’re perfect for filling out the rank and file of your military. Armed with the powerful A-280 blaster rifle, each Rebel Trooper in your unit contributes a single black die when attacking. Compared to Imperial Stormtroopers, who roll the weaker, white die, Rebel Troopers are much more accurate and dangerous. However, there is a tradeoff. Rebel Troopers have a lack of heavy armor, rolling the white defense die when defending against attacks. However, their natural maneuverability can make them quite nimble and difficult to hit. For a full preview of the Rebel Troopers, including their upgrade cards, click here! As a Rebel Alliance without the financial backing of a Galactic Empire, the Rebellion has to use whatever technology they can to gain an edge. Though AT-RTs were used frequently during the Clone Wars, the Emperor has developed new vehicles to replace them. However, the mobile walker is the perfect tool for the scrappy Rebels. The AT-RT Unit Expansion features includes a single new AT-RT miniature for you to add to your Rebel army, complete with three different gun attachments that can be attached to your miniature. What's more, this unit expansion offers an alternate miniature sculpt from the AT-RT included in the Core Set! Though only having a fraction of the armor and power of the massive AT-ST, the AT-RT only costs 55 points from your army, and it is much more mobile than its hulking Imperial counterpart. Thanks to its Climbing Vehicle and Expert Climber keywords, the AT-RT, much like troopers, can climb vertically over terrain and obstacles, making it a versatile vehicle. For its own weapons, the AT-RT offers you a significant degree of choice. In melee, an AT-RT can stomp back and forth with deadly grappling claws, which can shred infantry troopers with ease. Alternatively, the Rebel piloting the AT-RT can take potshots with his A-300 blaster rifle, firing in any direction, no matter which way your AT-RT is facing. And there are three distinct options for weapons that you could load into your AT-RT! For a full preview of the AT-RT, including its powerful upgrade cards, click here. Few vehicles are as important to the Rebel Alliance than the T-47 Airspeeder. Flying above infantry battles, this airspeeder is an intimidating presence on the battlefield and has even been known to take down hulking AT-ATs through less than conventional means. 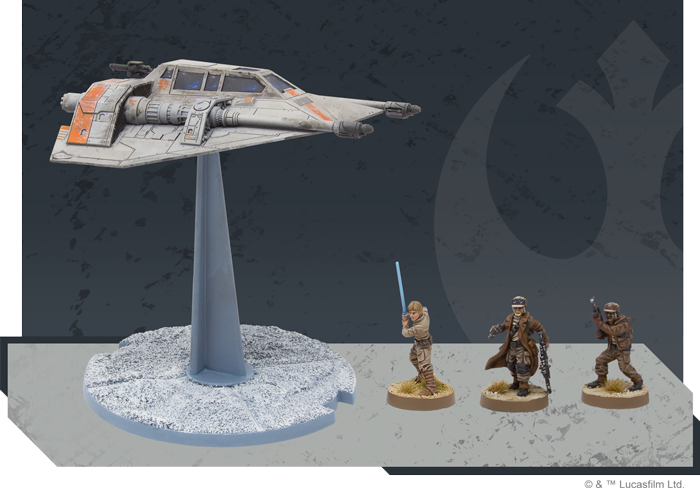 The T-47 Airspeeder Unit Expansion contains an unpainted, easily assembled T-47 Airspeeder miniature with all the cards and tokens you need to play. Like the AT-ST for the Imperial forces, the T-47 Airspeeder is a heavy unit—the first to become available to Rebel Alliance generals. And every plucky band of Rebels will need all the firepower they can get to bring freedom to the galaxy. These airspeeders feature speed-three movement, and they must perform a free, compulsory move at the beginning of each activation. By moving across the battlefield so quickly, it can be hard for other units to keep your airspeeders within range. With armor befitting one of the Rebel Alliance’s most iconic vehicles, infantry units will also have a tough time taking down an airspeeder. The Armor keyword means that only critical hits will be able to leave lasting damage. Also, because T-47 Airspeeders fly above the battlefield, they cannot be targeted by melee attacks or be affected by blast attacks. To supplement its maneuverability, the T-47 Airspeeder is equipped with the Ap/11 Double Laser Cannon, able to punch through armored foes with the Impact 3 keyword. For a full preview of the T-47 Airspeeder, including its upgrade cards, click here! 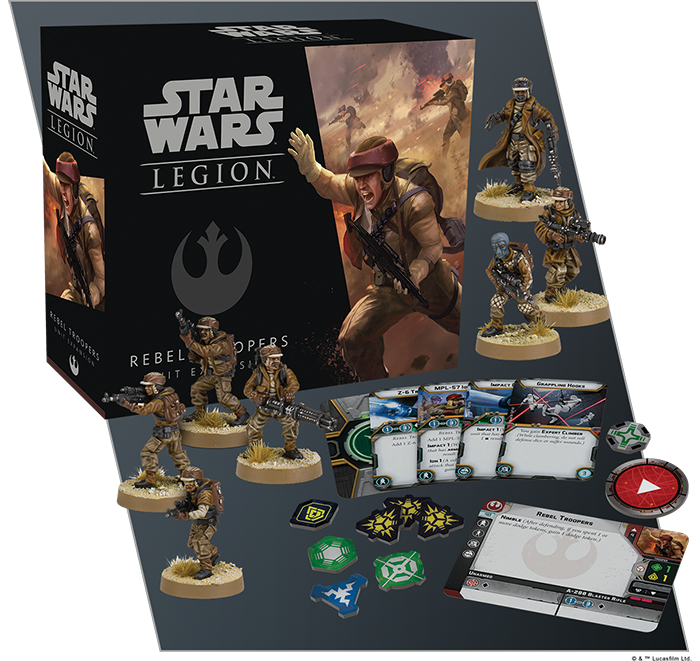 With the release of Star Wars: Legion, the most iconic battles of the galaxy come to your tabletop. But the rebels need reinforcements to give them the tools they need to overthrow a Galactic Empire and bring true freedom to the galaxy. 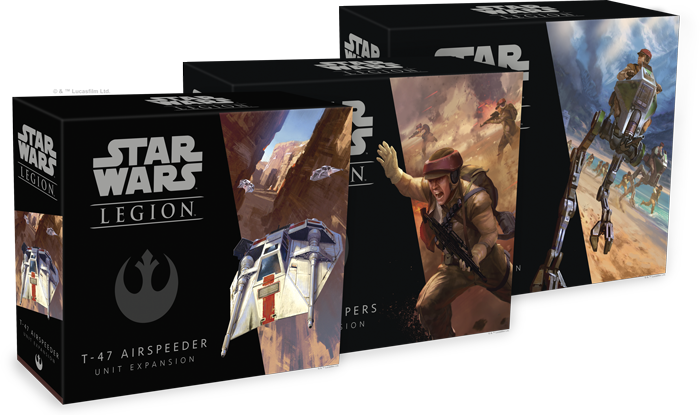 Boost your rebel forces with the Rebel Troopers Unit Expansion (SWL05), the AT-RT Unit Expansion (SWL04), and the T-47 Airspeeder Unit Expansion (SWL09) for Star Wars: Legion, available now from your local retailer or our website!